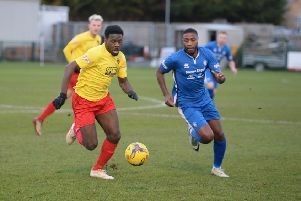 Totternhoe demolished MK Gallacticos by an incredible margin of nine goals on Saturday as they kept the pressure up at the top of SSML Division Two. It took just 90 seconds for Aidan Murray to give the hosts the lead as he reacted quickly to slot home the rebound from an Andy Cleere strike. Murray notched his second on 32 minutes and Joel McCormick grabbed a third four minutes later to put Totts in a strong position. Gallacticos pulled a goal back shortly before the break, when Ebeneezer Kpobi scored a great individual effort. The second half was an exhibition performance from the Totts though as they continuously put Gallacticos to the sword, scoring seven times. Cleere (46), Bishop (55), Lauder (59), Clarke (63 & 90) and McCormick who completed his hat trick (81 & 83) rounded off an incredible performance by the hosts, sending out a statement before important matches in February starting with the Beds County Cup semi-final against Crawley Green Reserves this weekend. Boss Chris Robson said: “It was a superb performance by the players given the conditions. “The pitch was very heavy, wet, there was wind and rain, but we managed to play some great football when in possession and some of the goals we scored were brilliant team goals. “We also had to add the other side of the game due to the conditions and from the off we just wanted it so much more and the work-rate and desire was so pleasing to see. “As a manager it is so difficult to prepare for games against Gallacticos as you never know what you will get from them. “On their day they should be up their challenging, as individually they have some talented players who can produce a bit of magic out of nowhere as their goal showed. “Their issue is the consistency and discipline of their players as they showed their weak side and we were able to take full advantage. “Credit to my players as when you go so far in front it is easy to switch off and forget about game-plans, try to do things your own way and try to get in on the glory, but until the 93rd minute they stayed professional and got their rewards by scoring 10. “I was so pleased with them all but a few individuals stood out. “It was good to see Joel back and scoring goals after a few weeks out. “Young Harry Rimmer was superb in two positions and is showing his potential which I believe could take him up the pyramid if he keeps learning and shows good commitment levels. “Andy Cleere was a handful up top, again coming back from a couple of months out. Totts: Bowley, Rimmer, Lauder, Dyer, Folland, Bishop (Murchie), Brent (Hibbitt), Golding (Clarke), Murray, McCormick, Cleere.